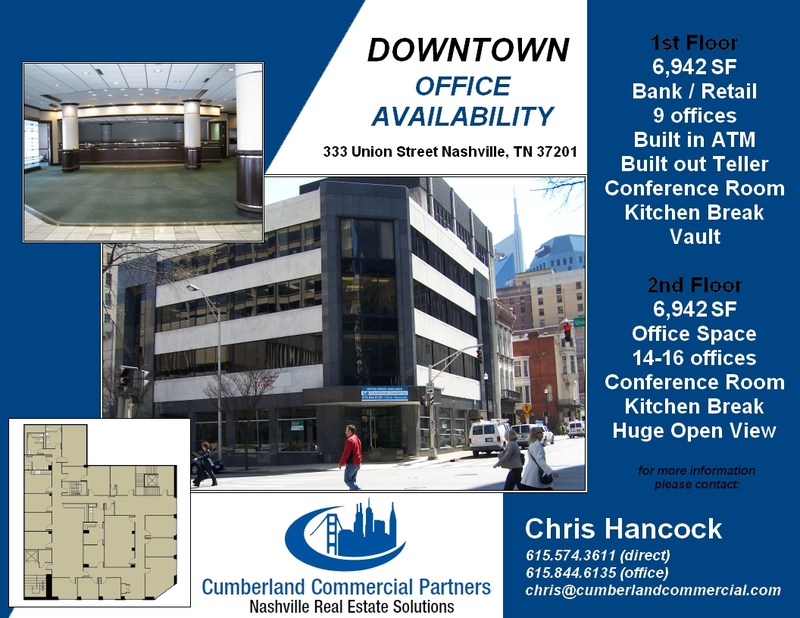 The street level of the 333 Union building offers a premier relocation opportunity for a financial institution seeking to establish a high visibility presence in Downtown Nashville’s Business and Financial District. The 4 story marble façade overlooking 4th Avenue North and Union Street offers a preexisting updated full floor bank build-out complete with vaults, tellers, offices and exterior ATM. The lobby is accessible from both the main corner intersection entrance and the 4th Avenue entrance. The main lobby space is fully built out with customer checking booths and includes 6 private offices, 2 open offices and 1 executive suite. All offices are enclosed in floor to ceiling glass with frosted accents and mahogany finishes. It would be extremely hard to find a banking space more readily made to open your doors in just days. This space was previously occupied by Fifth Third Bank. The second floor of the 333 Union building offers over 6,900 square feet of finished turnkey class B office space. Included in this office space are 10 executive exterior offices with windows overlooking 4th Avenue and Union Street, exceptional conference room space, interior offices, bullpen area, restrooms and full kitchenette. One of the few downtown Nashville office suites that offers unobstructed views over the heart of Nashville’s established banking headquarters including the Region’s Center mezzanine, Bank of America, SunTrust and Renaissance Bank. Hancock has successfully resurrected and restructured multiple deals that other, larger companies, abandoned after years of effort without satisfactory conclusion. It is his keen understanding of the downtown Nashville dynamics coupled with his ability to structure mutually beneficial deals that make Hancock the clear choice for representation.